With illustrations and text by Lee Ann Gunn, based on her full page feature in The Boston Herald on January 7, 2000. This is the story of how Nancy Schön goes about creating a cast bronze sculpture. 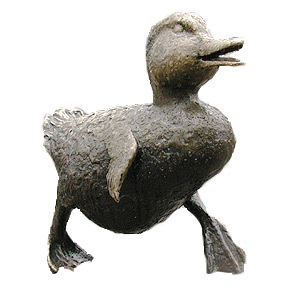 The example being used is her well known Make Way for Ducklings sculpture in the Boston Public Garden. The article by Lee Ann Gunn was written after Jack, one of the ducklings was removed by a scoundrel, and Nancy had to create a new Jack. Nancy used the book "Make Way for Ducklings" and original sketches that author Robert McCloskey donated to the Boston Public Library to develop her favorite poses for the 8 ducklings and Mrs. Mallard. From her sketches and reference materials, Schön first make a maquette, or a small 2 foot by 4 inch scale model, of the sculpture in wax. When she makes a presentation she shows the maquette. It allows others to visualize what her finished sculpture will look like. Nancy next starts on the actual size sculpture. She makes it in clay first. She uses plumbing pipes and aluminum wire to create an armature, which will serve as the bone structure. She attaches styrofoam pieces with wire mesh around it to build up the body. Once she has a rough shape she covers it with Plasticene, a non-hardening clay, and continues adding clay to form the duck. From this point on, Nancy works with a foundry in Everett, the New England Sculpture Service. A polyurethane rubber mold is made from the clay form. Depending on size or complexity of the piece, the rubber mold may have to be in several pieces; the mold for Jack was in halves. Foundry owner Jim Montgomery says they paint the first rubber coat on, then use a spatula for more coats. Then they cover the rubber with with plaster of Paris, making a two-part 'mother mold' which holds the rubber in place. Montgomery or one of his coworkers pours hot wax into the rubber mold to make a hollow wax cast. After the wax cools and is removed from the rubber, Schön uses small, sharp tools to correct flaws in the wax model. "This is the most important part. If we want a bronze, you have to make a wax," says Nancy. Next, a ceramic shell is made. The ceramic shell is important because it carries the shape and texture of the wax to the bronze metal that will be poured into it. To get the ceramic mold, the wax figure is dipped into a tank of a water-based ceramic mixture. A funnel is attached to the figure before it is dipped to allow the bronze to be poured into it. During the dipping, ceramic liquid goes inside and outside Jack. Ceramic liquid clings to both sides of the wax, so the two layers sandwich the wax. The wax Jack is dipped 11 times in the ceramic liquid and hangs on a clothesline to dry between each dipping. After the ceramic is cold, the wax figure in it's ceramic shell is placed in an oven to melt out the wax. Then the empty ceramic molds are fired in a kiln for about four hours. While the ceramic figures are still glowing orange from the heat of the kiln, Montgomery and his team pour the molten bronze from a hoisted crucible into the ceramic molds. Where the wax was, the bronze fills in. As soon as the bronze has cooled inside the ceramic, the ceramic shell can be chipped off. The finished bronze sculpture is about 1/4 inch thick. Once in bronze, the foundry can make small changes to, or chase, the surface. The foundry uses chasing tools of different sizes and shapes and air grinders to chip off small pieces, close small holes and smooth over seams on the finished bronze sculpture. The final coloring or patina of a bronze sculpture is applied using a combination of chemicals and heat. Schön comments, "We have to do in an hour what it takes Mother Nature 10 years to do". In order to install a sculpture, stainless steel rods are inserted in the bottom of the sculpture protruding a sufficient number of inches to be buried in cement footings. These footings must be below the frost line in order to keep the sculpture in place with the change of temperature.